The Bukit Peninsula dangles off the bottom of Bali connected to the mainland by only a thin strip of land. In fact, it appears to almost have broken away completely in an effort to form an island of its own, an island that would be one of the most wave rich environments in the world even without the rest of Bali. The Bukit Peninsula has a truckload of good waves along all three sides of it and a handful of truly world class waves, such as Padang Padang and Uluwatu, on its west coast. Bingin is located about halfway down the west coast. 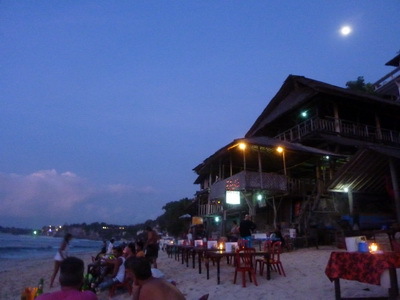 It’s a relaxed little village built mostly into the limestone cliffs that overlook the narrow strip of beach below. A series of steep stairways have been carved into the cliff side and wind their way down to the beach around various guesthouses, warungs and ding repair shops, all of which overlook the main break… a quick and short barreling lefthander that does its thing over a sharp reef. It isn’t long but it is perfect. At higher tide, it’s not too sketchy. At lower tide, it is. And that’s basically all there is to Bingin… not that there’s anything wrong with that. While I stayed there for close to a week, I only surfed the wave at Bingin a couple of times as there was a crowd of locals and Aussies that had it thoroughly wired which made it very difficult for the less skilled and aggressive among us to get waves. Fortunately, Impossibles was a short walk south and Dreamland was a short walk north and Balangan was just around the headland to the north of Dreamland. So there were plenty of options for waves in the area. While looking perfect from the cliff, Impossibles can be impossibly fast (hence the name) and thus you better be quick going left unless you want to spend the majority of your session getting better acquainted with the reef after failing to make one of several sections that show themselves as the wave peals down the reef. 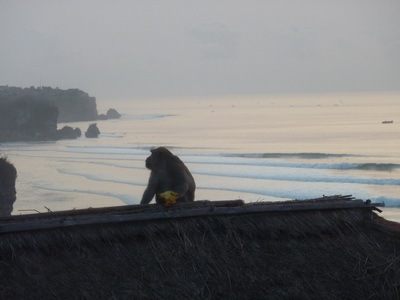 This dude was enjoying a mango dinner during sunset one evening in Bingin. Not sure if he was part of the gang I met on the beach. That’s Impossibles in the background. In contrast, there is nothing impossible about Dreamland… except for the nearly impossible to believe scene on shore which seems to be comprised mainly of Chinese and Russian tourists on package holidays at the thoroughly terrible resort that was constructed on the cliffs several years back by one of Suharto’s crooked sons. The Chinese seem to take great delight in getting a bit too close to the pounding surf, getting knocked over by such surf and having it all captured on film by their significant others, all while displaying a keen sense of fashion. Women of all ages (including those in their 20’s) seemed to be partial to those one piece bathing beauty swimsuits with little skirts stitched into them that are popular in old films and retirement communities in South Florida. Dudes, on the other hand, dared to bare a little more (make that a lot more) and went with Speedos. And in several cases, when the Balinese gods were smiling upon me, I caught sight of a few couples in swimsuits with matching patterns. Deandra and I plan to employ a similar strategy with our swimsuits on whichever Thai islands we end up on in January. Stay tuned for photos. The Russians, on the other hand, seemed to busy themselves mostly with smoking and drinking and getting sunburns. As awesome as the action was onshore, it was fairly decent offshore as well. Dreamland breaks to both the left and the right and does so in deep water. Bouncing off the reef (what there is of one) isn’t much of a concern and booties are not needed. It’s nowhere near a world class wave. But it’s fun (particularly at a couple of feet overhead) and uncrowded and the water is an amazing shade of turquoise, and thus it’s a very nice change of pace from Bingin. Mornings in Bingin were mostly spent surfing. 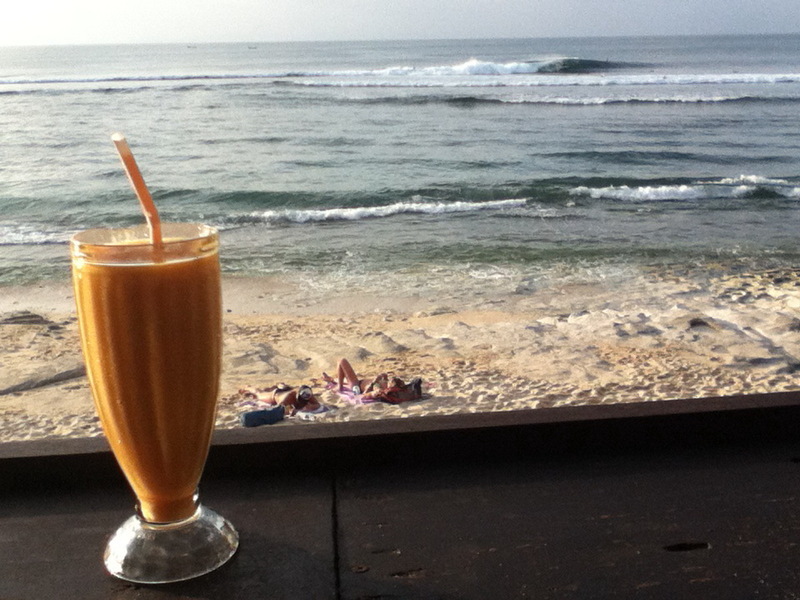 Middays and early afternoons were mostly spent hiding from the sun, reading Australian surf mags and drinking smoothies in one of the warungs overlooking Bingin, and late afternoons were mostly spent surfing again. Evenings? 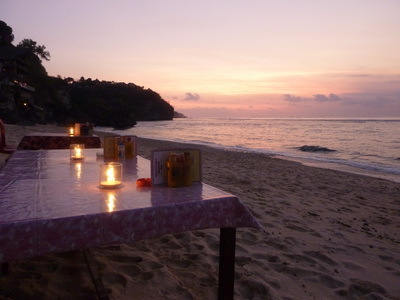 Those were often spent sitting on plastic chairs at tables in the sand eating beautifully grilled red snapper and drinking Bintang. It was possibly the best grilled fish I’ve ever had. Each of the various grill masters had a cooler stocked with very fresh fish, shrimp, squid and clams. You choose which you want and then they weigh it and charge you accordingly. Best I could tell, the cooking process involved gutting the fish (but otherwise leaving it intact) and then basting it with coconut juice and a little bit of lime while they grilled it over wood charcoal. They served the fish with some stir fried water spinach (at least that’s what I think it was… it was something green and tasty), white rice and a delicious homemade sambal sauce (hot sauce). 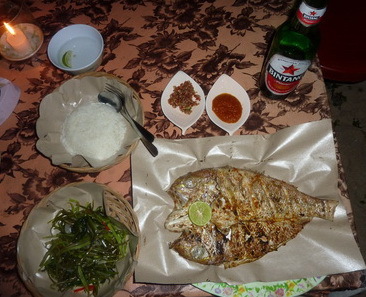 Pair it with a large, icy cold Bintang and a table in the sand about 15 feet from the ocean, and you’ve got yourself an amazing dinner. As appealing as that routine was, I did manage to shake it up a bit on a few occasions. 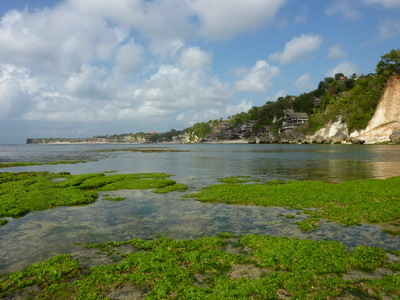 Once with a long exploratory walk on the beach at very low tide which opened up a world of tide pools en route down to Padang Padang. It also ended up with me in uncomfortably close quarters with a pack of shellfish eating monkeys among some large boulders on the beach. And that was a place I’d rather not have been. Monkeys worry me. Another afternoon, my friend Erik (a fellow Surfrider member from LA with whom I was put in touch by another Surfrider member from LA) took me to a Balinese orphanage called Bali Life. He got involved with it a while back on a surf trip and is currently living in Bali and working with the orphanage in several capacities although his primary focus right now is making a documentary film telling the story of this fantastic place. I came bearing gifts of soccer shorts and taco seasoning which are the traditional gifts that the Balinese bring when visiting an orphanage. Not true. The boys needed shorts and Erik wanted to cook tacos for the kids and hadn’t been able to locate seasoning in Bali and thus I brought them along from LA. I miss tacos. Unfortunately, the twenty or so kids were having an afternoon nap during my visit and thus I didn’t get the chance to meet them. But I did get to check out the current facility as well as the new facility that is under construction. The new digs will ultimately be home for some 64 kids. It is really an unbelievably cool place. The Australian dude who founded it some years back is all about sustainability. Thus at the current home, they have two large outdoor tanks in which they are raising catfish and shark (!) to be mostly eaten at the home with the excess being sold. The old water from the tanks is routed into a sizable garden in which they are growing loads of vegetables. Again, some are eaten at the home and some are sold. And the new home takes the sustainability to an entirely different level. They will be capturing all of the rain water off the roof and routing it into the garden. They also will be raising pigs, chickens, ducks and a few cows. Two luxury hotels nearby have been kind enough to agree to provide all of their food scraps to Bali Life with which they can feed the animals. And the animals, in turn, provide fertilizer for the expanded garden they will be installing. The intent is not only for these practices to provide a nicer home for the children but to also provide an example for the locals as to how things can be done more sustainably and more productively. And if you ever find yourself heading to Bali and would like to stop by with gifts or any other contributions for the kids, let me know and I can put you in touch with the proper people. Also, keep an eye out for the documentary. It’s really a great story.